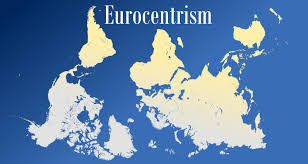 A recent post "On Eurocentrism" from Liam Bright on his blog The Sooty Empiric raises some interesting questions about the role of Eurocentrism in the study of non-Western philosophy. While Bright is not writing specifically about the study of Indian/South Asian philosophy (my area of academic specialization), I thought it might be worthwhile to start a conversation about these issues here on my blog. Bright, who is a "consumer" rather than "producer" of work on non-Western philosophy, begins with a phenomenon he has noticed. ... so here is a thing I see a lot of in articles introducing English speakers to some form of philosophy that is not typically studied by English speaking philosophy students. (I am going to say "non-mainstream-Western" philosophy, but only because I don't know a better way of referring to the class I have in mind, that's not a great term either.) ... I see a lot of this because I actively seek such work out - I think it is great, under-appreciated, and has immeasurably enriched my philosophical and personal life. So naturally I am going to complain about it. Bright goes on to attribute this tendency to two types of Eurocentrism. I recommend reading the entire post here. Rather than respond in detail myself, I thought I'd leave readers with a few questions to consider and (hopefully) to discuss. Do you think Bright is identifying a feature that is present in much work on non-Western philosophy today? If so, is it problematic? It this a type of Eurocentrism, "benevolent" or otherwise? Is the situation different when it comes to work on Indian/South Asian philosophy? What would non-Eurocentric work in non-Western philosophy look like (if it does not exist already)? Are comparative projects that do not take Western philosophy as one of its subjects of comparison, more pure history of philosophy projects, or more historical-textual studies the answer? Or do we need to imagine an entirely new approach? Let me just say a bit on question two. My sense is that my sub-field (especially work in English and other European languages) is shaped by its opposition to "mainstream" Western philosophy, but that the precise ways in which it is shaped are somewhat different than the ways Bright has identified. Part of this may be that there is a great deal of diversity within the Indian tradition when it comes to mind-body dualism, embodied knowledge, communalism, and so forth. Perhaps another factor has to do with the specific forms of Eurocentrism (especially Orientalism) that form the historical context in which this sub-field developed. Consider, for instance, two major trends: the tendency to focus on "religious" or "soteriological" aspects of South Asian thought and the tendency to be especially concerned to compare South Asian philosophy with contemporary analytic philosophy. What do you, dear readers, think about all this? Cross-posted on the Indian Philosophy Blog.